What's the Difference between Spider-Man the Comic Book and Spider-Man the Movie? 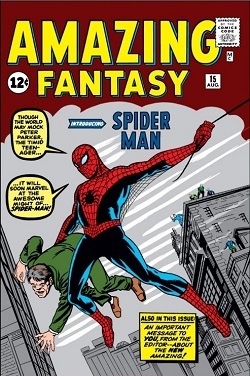 Peter is introduced to Mary Jane by his Aunt May while he is in University. Mary Jane lives next door to Peter while he is in high school. Peter develops the web shooters himself. He has to refill them in order to keep shooting webs. After being bitten by the radioactive spider Peter develops holes in his wrists that shoot spider webs when he curls his fingers into his palm. Peter is attending a radiation exhibit at the local science hall when he is bitten by a spider. He goes on a field trip with his high school to the Oscorp lab. The Green Goblin's mask features blinking eyes and a moving mouth. The Green Goblin's mask does not convey emotion.